Whether you are camping, hiking or going on an exploration you will likely be needing a sleeping bag. Though not every sleeping bag will be suitable particularly in cold weather, you will need something that keeps you warm and has excellent insulation not to mention being lightweight and generally practical can also be important. There are a host of different options out there ranging from very cheap to master explorer prices. 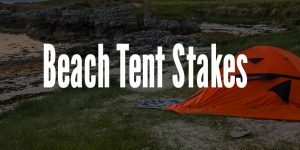 I have tested and used a plethora of different options from many different manufacturers and below I have rounded up my favorites. With this sleeping bag I really liked the material they have used – everything is of the utmost quality and really just screams premium. 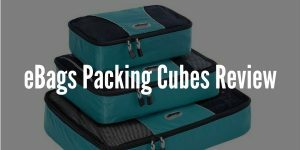 The bag itself is made from a nylon fabric that has ripstop which makes it really durable and can stand withstand a lot of pressure and force without becoming ripped or damaged. The bag itself is surprisingly lightweight especially considering the strength of the material and this could easily be a solid choice for a backpacker for example. In terms of comfort it was good and it does a great job of keeping you warm. Though if you are going to use it on the ground in a tent for example you can start to feel the ground chill when it gets colder, but I always personally use a sleeping pad which will prevent that from happening. 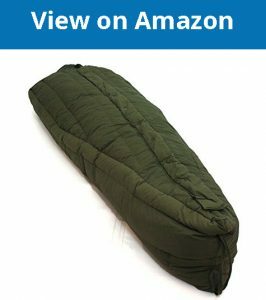 In my list I wanted to include a sleeping bag that offers quality but at a low price point and this is my choice if you are looking for the best value. This sleeping bag keeps you really warm at really low temperatures and is advertised to work well to as cold as 0F. In my usage it kept me nicely warm and it’s very also really soft and comfortable to sleep in. With this sleeping bag you have a host of different color options and even the option to choose what side you want the zipper on. The sleeping bag is a little heavier than some of its counterparts but it’s nothing unmanageable and it weighs in at about 5lbs. I would also say if you are above 6ft in height you should probably consider the bigger option which is a better size for taller people. 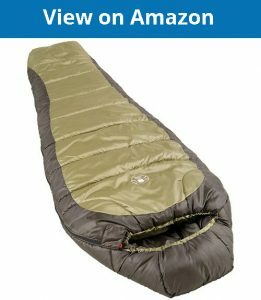 This Coleman sleeping bag is another choice that I really liked that was available at a great price point. This bag has a mummy sleeping bag style as you can see from the pictures. This bag did a good job at keeping me warm in my usage at 30F. In terms of comfort I was happy though it wasn’t the best I have used. A nice feature I liked was the hood at the top of the sleeping bag which has a draw string and can be used to fit snuggly around your head to keep as much of the heat in – which worked really well and is a nice design implementation. The one downside I didn’t like was that the bag isn’t the best choice for backpackers and it doesn’t compress that well and therefore isn’t a good choice for someone who will need to carry it with them, but for something like camping a think it is a good choice. Doesn’t compress well and isn’t a good choice for backpackers etc. 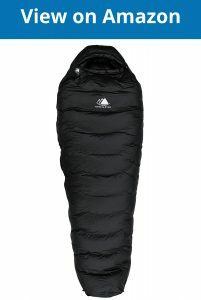 I wanted to include one double sleeping bag in my list and here it is. 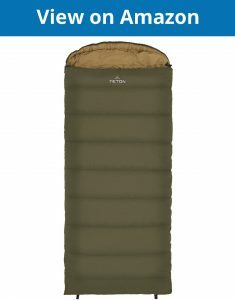 This double sleeping bag is made from TETON and has the same level of quality as their single sleeping bag I listed above. The outer layer of this sleeping bag is strong and also soft, and the inner layer is really soft and cosy. 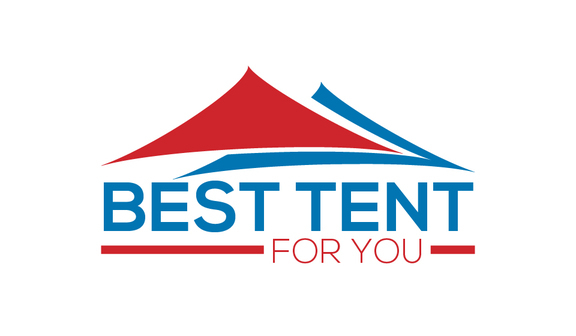 The inside is really high quality and was a pleasure to sleep on – it’s top-notch quality. Not only is it really comfortable but its works flawlessly in cold weather. For example, even at 35F I didn’t even need to layer up and only worn a t-shirt and underwear and I was still warm and cosy inside this sleeping bag. I would also like to mention the zippers on this are great and some of the best I used – there are zippers on each side which is great when a couple are using this – you can leave the sleeping bag without disturbing your partner. 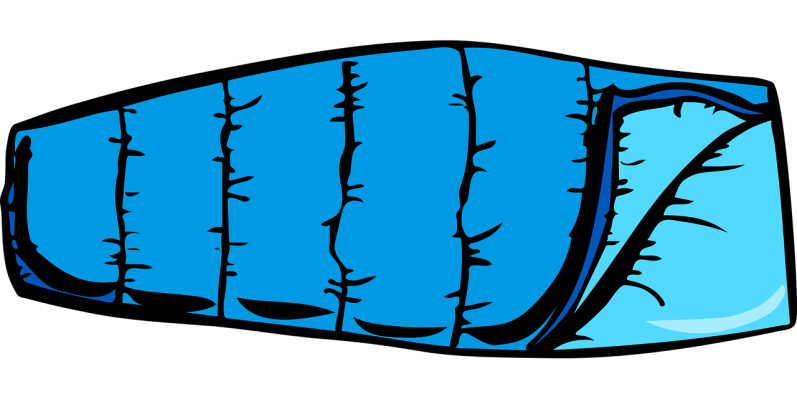 This sleeping bag can also be put into the stuff sack and can be carried as if it was a backpack because that resembles its form factor. If you are looking for a sleeping bag with one main thing in mind and that’s keeping you warm, then this is your best bet. This is a military sleeping bag! So that means it really is top of the line when it comes to quality. It keeps you extremely warm even in freezing temperature and it was one of the best I used for that alone. 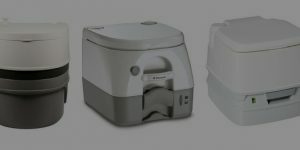 The materials that are used are great and are very durable and will undoubtedly stand the test of time. 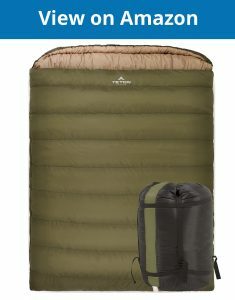 The one clear downside with this sleeping bag is that’s its heavy and it doesn’t compress that well at about 30 Litres.